Using natural stone as a flooring, wall, or accessory material in the bathroom brings a look of elegance to the environment. Many popular marble styles can be used to cover the floors and are even available as floor thresholds. Travertine is another popular stone that is used extensively for wall design. One of the most requested materials for the bath and shower area are the quarter-circle or half-circle stone slabs used as corner soap shelves. A soap shelf can be place directly into the tiled wall of a shower stall. Filled travertine tiles are quite rustic in appearance, yet they are waterproof and are popular for use as a wall tile material in single family homes, condos, and hotels. The accompanying soap shelf is cut from the very same material and nicely complements the limestone used for the stall lining. Travertine is a limestone product, formed when water percolates through to a lower level rock formation. The contaminants present in the water contaminate the soft rock below. Stalactites and stalagmites in caves often have a travertine mineral makeup. Most of the world’s quarried travertine comes from areas that were once part of a gigantic hot spring. The stone slabs are cut away and sent to a manufacturing facility where they are thinned and shaped into tiles, pencils, mosaics, and flat stones. 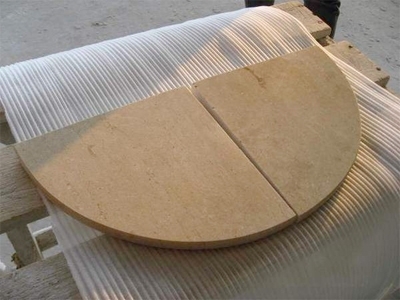 At Stonexchange, our travertine soap shelves are cut from large circular pieces of material, given a smooth polish, and have a rounded, beveled edge. Travertine is rather rough in texture, and the smaller pieces used for mosaics, insets, and pencils are often tumbled to give the material a rustic appearance. The travertine used to make soap shelves is much more smooth, is either light off-white or mocha in color, and has very nice mottled patterns. The actual color shade seen in the stone is the result of mineral contamination, and the stone itself is non-porous. A typical size for a soap shelf is a quarter-circle cut from a 9-inch radius piece of travertine. The thickness varies, but the most commonly requested size is 5/8-inch or 1/2-inch. Depending on the style ordered, soap shelves may have a rounded edge or contain a bull nose around the perimeter of the stone. These soap shelves are manufactured near the quarrying operation, packed into full crates, and shipped overseas to a direct importer and distributor such as Stonexchange. Hard to find in the local floor retail outlet, these stones are available in 50-piece counts from the distribution center at Stonexchange. Our company maintains a full inventory of this specialized travertine product and will ship it to commercial customers nationwide. 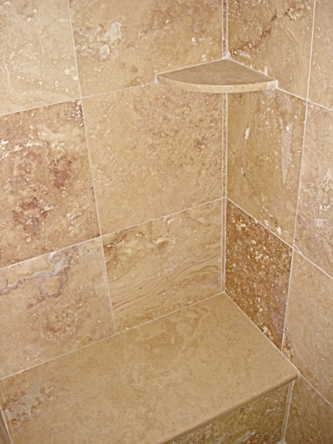 Our travertine corner soap shelves for showers are made from high-quality, durable stone. They are expertly cut to exact size. The circles of stone are 18 inches in diameter and cut into perfect quarter-circles. The pieces are then packed into small crates, each crate holding 50 soap shelves. The crates are sent directly to our Florida-based distribution center, awaiting transport to our commercial customers. In addition to our travertine soap shelves, we carry a full line of quarter-circle shelves made from natural marble. These styles include the popular Crema Sahara Marfil and the off-white Nuevo Carrara. We also import Absolute Black soap shelves, manufactured with a half bull nose edge. Our engineered white stone soap shelves are also cut from a 9-inch radius circle and are available with a rounded, half bull nose edge. Our shower seats are twice as large as the soap shelves and are also quarter-circles. These are difficult to find in most flooring product retail stores or home improvement centers. Many of our commercial clients now order these products from us in full 50-piece crates, meaning that they can maintain a full inventory year-round. Full-crate delivery means that construction projects requiring one or more bathroom soap shelves or shower seats per living unit can obtain the entire material count in a single order. Our wholesale pricing has made it more affordable than ever for installers and subcontractors to acquire this specialty product. Stonexchange sells marble, granite, and travertine products to retail chains, construction companies, and independent contractors/installers. Our soap shelves and shower seats are sold in crates of 50 pieces. This means fantastic savings on a premier stone product. Our Florida-based distribution center is stocked with numerous crates of shower seats and soap shelves throughout the calendar year. Clients who need to procure this material on a constant basis can set up a recurring order schedule with our sales staff. Large projects such as a residential development or a hotel may require hundreds of soap shelves. These orders may require a special overseas shipment, but our sales representatives will be happy to arrange a large order and can give clients a very accurate delivery date. We personally inspect each and every order to make certain that the color and texture is varied. This is important because no two pieces of travertine are exactly alike. Installers who place travertine tiles in a shower stall usually go through a number of placement patterns before choosing the final arrangement. It is vital that a soap shelf be found that closely matches the overall texture and color shade of the shower stall walls. Ordering in bulk solves the per-piece cost problem because of the wholesale prices enjoyed by the purchaser, and it also ensures that variety in the piece coloration is sufficient. Our orders are sent via overland freight carrier, and the product is packed in crates lined with plenty of shock absorbing material. This minimizes breakage and helps bring down our final purchase price even further. When compared to the cost of soap shelves and shower seats displayed in smaller retail outlets, our bulk ordering process simply makes good financial sense. Our retail merchant clients are especially pleased at the ease with which they can obtain 50-piece orders on a regular basis, saving tremendously on their purchase price. The direct import and distribution process is not all that complicated, but it does involve timely shipments, careful inventory management, and import tariffs. Our company strives to provide our clients with the best quality marble and travertine products on the market, and we are committed to keeping our prices at or below the competition. As a direct importer, Stonexchange also carries matching floor tiles, window sills, and transition thresholds. For complete information on how to design a mixed order of various natural stone products, feel free to contact us with your order details. We will show you just how simple it is to obtain the finest travertine, marble, and granite products on the market. Our rapid shipping, excellent customer service, and special non-standard size order arrangements come with no extra charge.